On 20th December, Pat and I took a short, chilly, walk round the beach at Clashnessie (NC0531), between hail showers. Conspicuous, both along the tide-line and further back, were heaps of the large brown seaweeds known as kelp, which had probably been detached from areas at or below low water by the strong northerly gales we experienced earlier in the year (Photo 1). Anything maritime is still a novelty for me, having spent my working life over 100 miles from the coast, so I took a closer look. 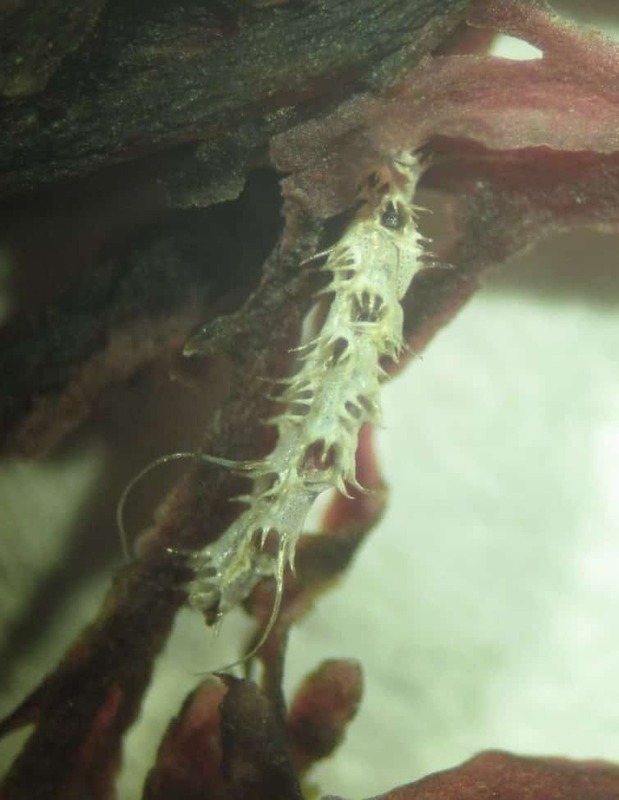 The commonest forms of kelp were two species of Laminaria with broad blades divided into strap-like ‘fingers’, tangle or oarweed L. digitata and cuvie L. hyperborea (Photo 2). The former has smooth, narrower, cylindrical stems, the latter rough, broader, tapering ones. Both have substantial branched holdfasts. Less common were the wavy-edged undivided fronds of sea belt or poor man’s weather glass L. saccharina and also the detached studded holdfasts of furbelows Saccorhiza polyshides. 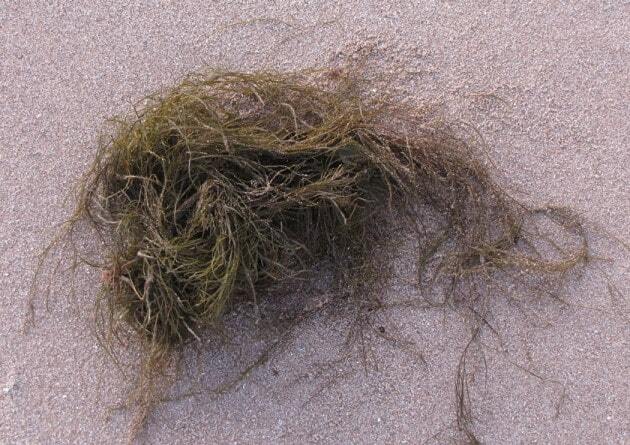 The rough stems of the cuvie were covered with the remains of smaller epiphytic seaweeds (Photo 3). Washed up on the strandline were more specimens of these smaller species, which had been wrenched from their original substrate, whether kelp or rock, and I brought a sample of these back for more detailed investigation. I made a colour copy of a selection of five of these, as an aide memoire, while they were still fresh (numbered (1) to (5) in Photo 4). Since most appeared to be red seaweeds, I then set to work trying to name them, using the Aidgap key to that group by Sue Hiscock (1986) (Photo 5). It took me an hour or two, but I was able, eventually (and rather to my surprise), to put names to all, using photographs on Google as confirmation . Top left (1) is a brownish-red species with cylindrical, bifurcating branches, tapering to a point, Furcellaria lumbricalis. Its specific name refers to the worm-like terminal segments (Lumbricus is a genus of earthworms). It is a species of the lower shore and shallow sublittoral. 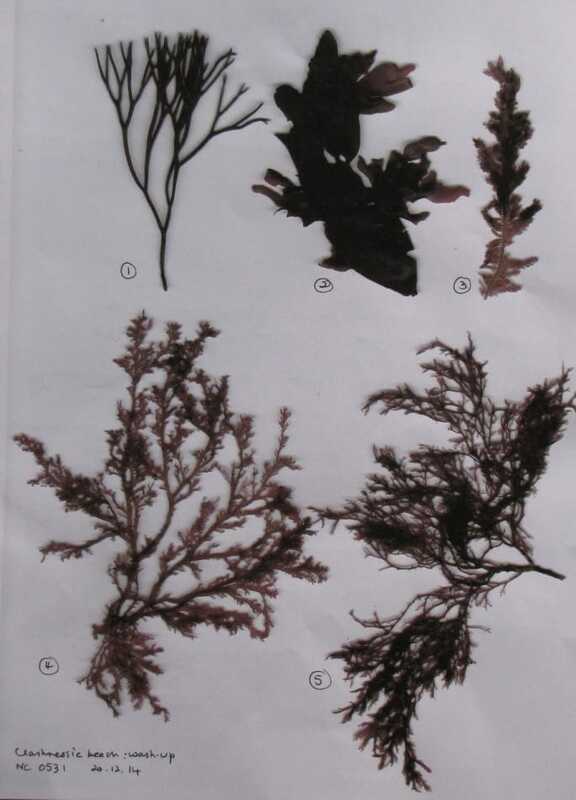 Top middle (2) is a common species I have seen before, with large dark red, flattened fronds, bearing characteristic proliferations round the edge, dulse Palmaria palmata. It is often epiphytic on cuvie and is apparently edible, either raw or cooked. Top right (3) caused me some head-scratching. Under the microscope, it had very neat, close-packed, opposite branches, more or less in one plane, like a feather, with further branchlets on some of them. The general look was reflected in its name, Ptilota plumosa. It is epiphytic on kelp at extreme low water (Photo 6). 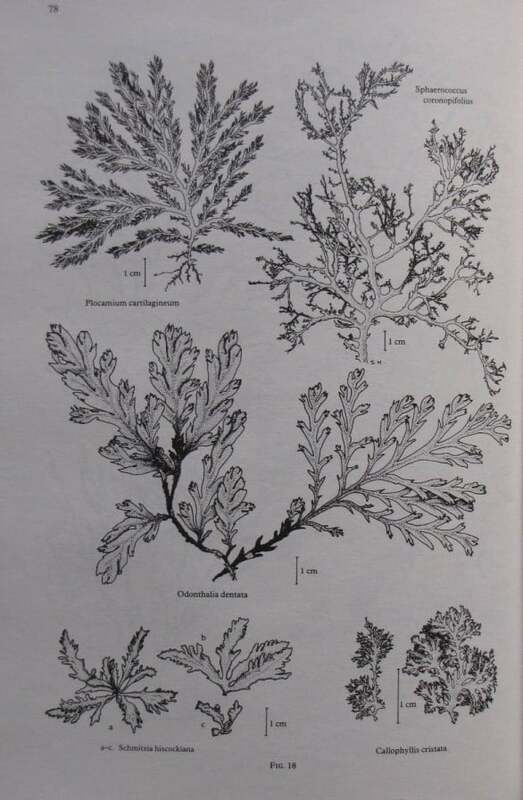 Bottom left (4) had flattened red fronds, much divided but lacking a mid-rib and the smallest branches bore single-sided slightly-hooked combs of branchlets. 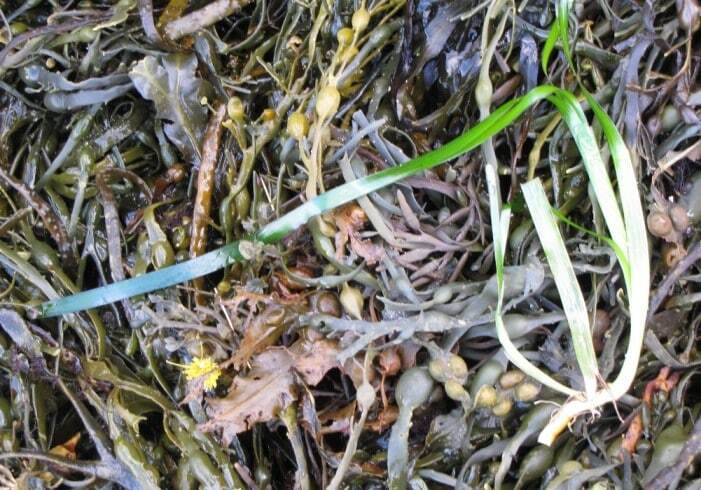 This is Plocamium cartalagineum, another species found on kelp stalks in pools low on the shore and below (Photo 7). Bottom right (5) looked superficially like (4), but there were signs of a darker, somewhat indistinct, mid-rib in the flattened blunt-ended fronds, and curious, dark, spherical inclusions in some smaller branches. These inclusions were the clincher, enabling me to name it as Sphaerococcus coronopifolius. The specific name refers to a flowering plant, swine-cress Coronopus, which has similarly blunt-ended leaves and the inclusions are cystocarps, female reproductive organs. It is usually sublittoral. 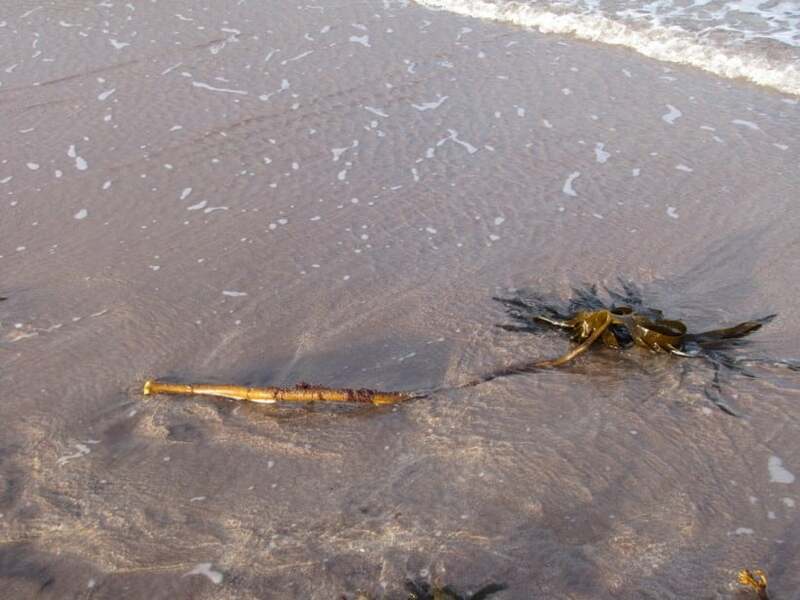 Also tangled in the kelp or lying free on the beach were untidy masses of a fine, much-branched brown seaweed, over 30cm. long, with short, sharply-pointed side branches, looking a bit like thorns. This is Desmarestia aculeata, witch’s hair, or less flattering, landlady’s wig (Photo 8). In summer it bears very fine tufts of branching filaments. It is again a species of the extreme lower shore or shallow sublittoral. I checked the National Biodiversity Network for the distribution of these species and most had been widely recorded on the west coast of Sutherland, but not always, curiously, from NC03, the hectad in which Clashnessie lies. On a further visit on 29th December, to take photographs, some bright green strap-shaped leaves, springing from whitish rhizomes, stood out amongst masses of wrack higher up the shore. These were detached pieces of eelgrass Zostera marina, a member of the only genus of truly marine flowering plants found around the British Isles, which grows on sandy bottoms down to 4m. in depth. 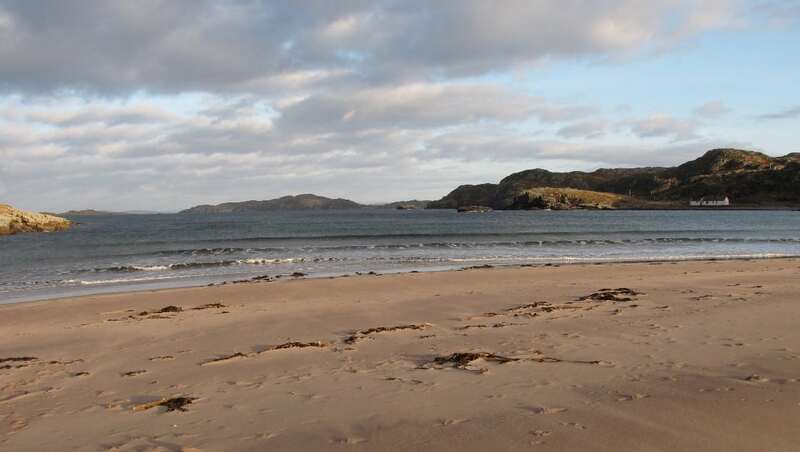 We have previously found washed-up examples on most of the Assynt beaches, but have only seen it growing in situ in one place, in the bay below the Viewpoint at Drumbeg, where Trevor Lockie found it (Photo 9). 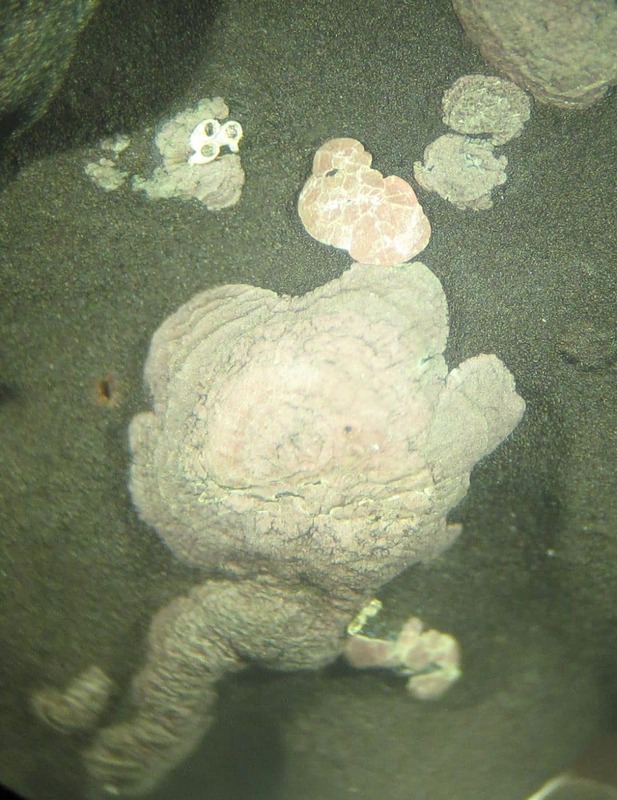 As a foot-note, looking at the red seaweeds mentioned above down a low-power microscope revealed a further intriguing layer of diversity in the marine community. In places, the narrow ends of the fronds of some bore a fuzz of really tiny seaweeds, probably reds. Older parts of the fronds were invested with a greyish growth (seen en masse) of the now-empty cases of the colonial animals known as bryozoans or polyzoans (phylum Ectoprocta). The most conspicuous were the beautiful, bristly cases of the hairy sea-mat Electra pilosa, which occurs from mid-shore down to the shallow sublittoral. When alive, the individual zooids bear a ring of ciliated, retractable, tentacles which protrude from their cases, filtering the surrounding seawater (Photo 10). 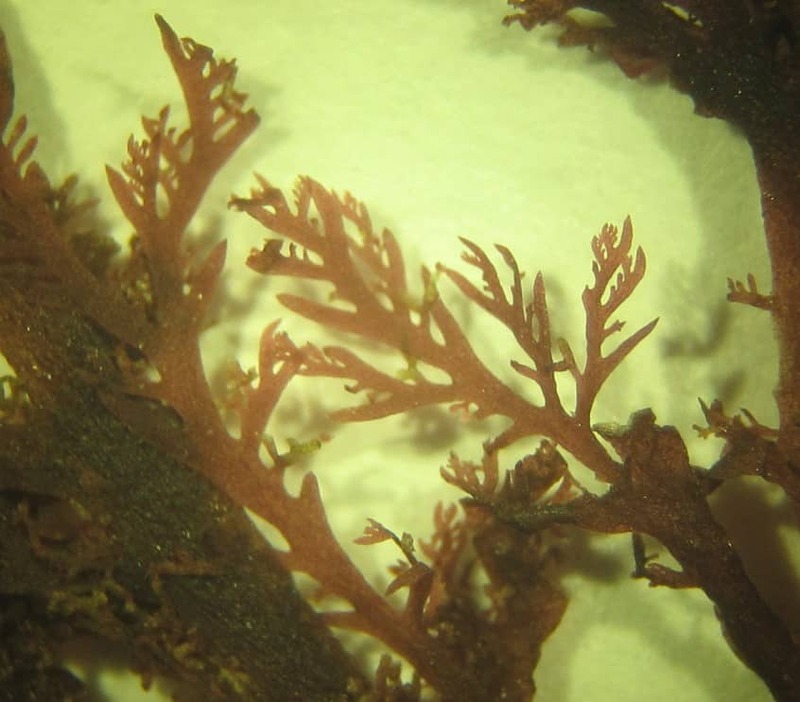 Lastly, the dulse, which does itself grow as an epiphyte on kelp, had smaller encrusting epiphytic growths, in various shades of pink, at most a couple of millimetres across, which I take to be other red seaweeds (I am reminded of the verse Big fleas have little fleas…). Their identification is beyond the scope of Hiscock’s key, requiring the use of a high-power microscop and specialist literature, so I have been content just to admire them (Photo 11). 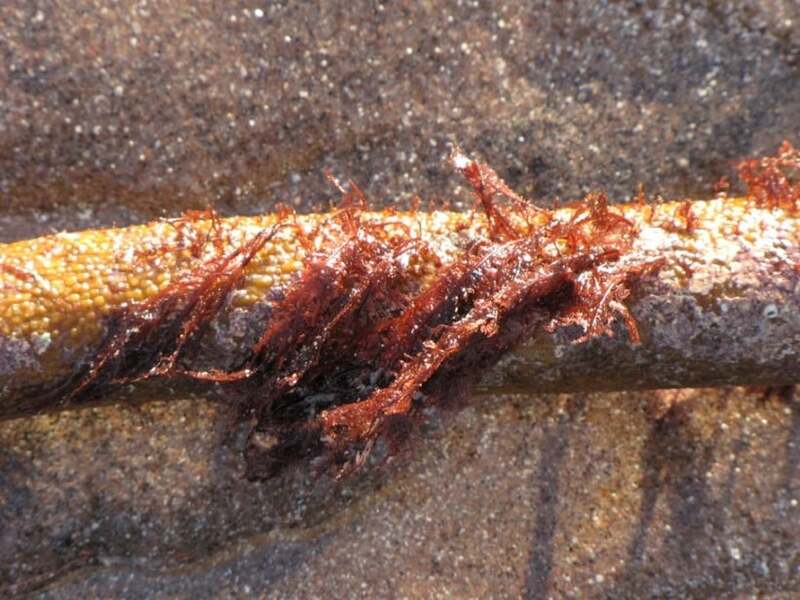 Some 350 species of red seaweeds have been recorded from around British coasts, of the total of about 650 seaweeds known to occur, and they are recognised as a challenging group to name. There are also a few freshwater species. They are now assigned to their own phylum, the Rhodophyta, which is thought to have a quite separate evolutionary history from other groups of ‘algae’. Reference. Hiscock, Sue (1986). 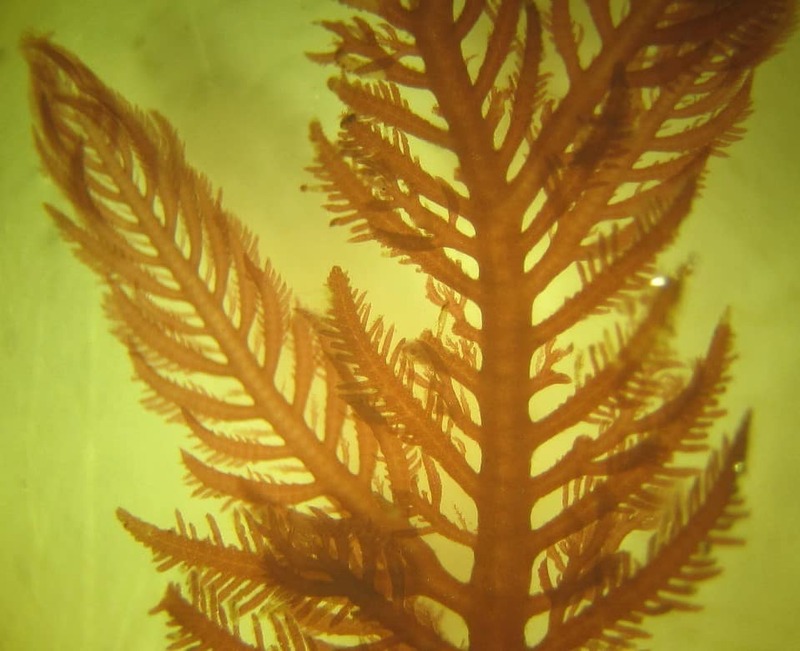 A field key to the British red seaweeds. Field Studies Council.